About the Author Jen Osborn teaches her cutting edge techniques at mixed media conferences. A gallery of mixed-media and fabric art to help inspire your own works of imagination. For these bird note cards, I roughly cut a rectangle of linen fabric to the size of the card front, and machine stitched to the cardstock. She's spent time among the magazine pages as both a published artist, and as a columnist while teaching her techniques online and across the U. Watch out, she also runs with scissors! Original bonus embroidery designs to enhance the projects or spice up your own fabric creations. The book comes with pattern shapes you can photocopy, but the projects are made mostly from measurements and many do not require any pattern pieces. A heart sewn lovingly over the top hides how you attached it, and gives it just that little extra punch of love. The instructions take you from the beginning to the end of each project so they are quite useful if you like detailed how-to's. Jen's art has been on display as part of group shows at The Paper Studio and A Studio Gallery. If you are interested in having me come teach, you can email me using the link below. I thought it a pity that Osborn didn't choose some of the pieces in the inspiration gallery - fabric cards, scrapbooks, art quilts and journals, many of which I found a lot more interesting visually - as projects for the book. Whether you're a mixed-media artist or a passionate sewer, discover innovative ways to combine fabrics, textures, found objects and more to create meaningful pieces of fabric art. The Out-and-About Purse is a stand-out with its stitched fabric leaf and vintage button embellishment. Cynthia and I share a love of zakka everything and anything that improves your home, life and appearance , and adding simple and decorative stitches to your solids gives this apron a zakka flair. Other than the chapter on dyeing fabrics, I didn't learn much. The bird images are stickers. Jen includes some quirky, almost gothic embroidery designs i. Techniques for dyeing your own fabric to achieve custom colors for any project! She also delves into drawing on fabric graffiti-style and the proper tools for sewing together unusual items, like fabric and cardstock, chipboard, photographs, ticket stubs and more. Step 7 Now, my friend Jenny is a bit sassy, so I wanted to hand stitch on a little bit that would allow her to strut her stuff, and add a bit of sparkle to her step. 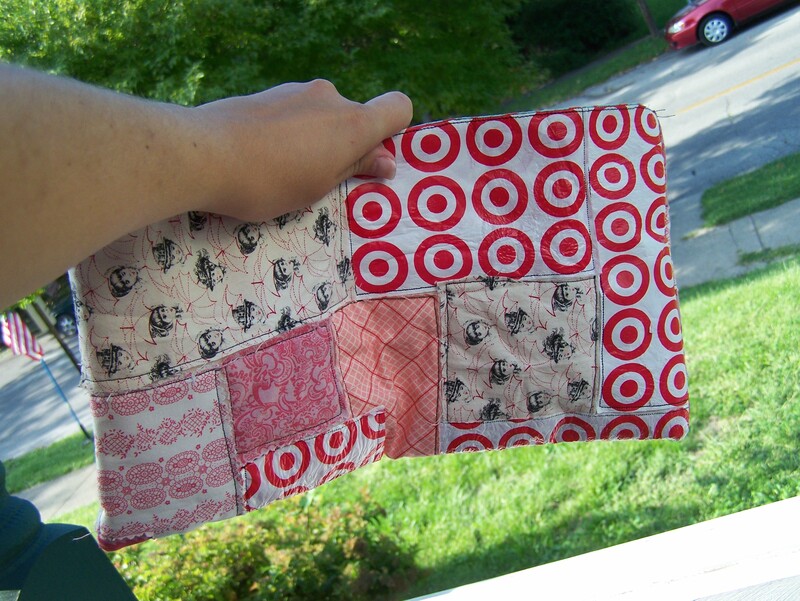 Although I love patchwork and even the messy look, I personally didn't find the projects very inspiring. Used textbooks do not come with supplemental materials. Original bonus embroidery designs to enhance the projects or spice up your own fabric creations. The instructions take you from the beginning to the end of each project so they are quite useful if you like detailed how-to's. I thought it a pity that Osborn didn't choose some of the pieces in the inspiration gallery - fabric cards, scrapbooks, art quilts and journals, many of which I found a lot more interesting visually - as projects for the book. I still love to teach, and promise that if I come teach at your retreat or studio, I will share all the goodness that lives inside my noodle along with all my techniques and ideas. 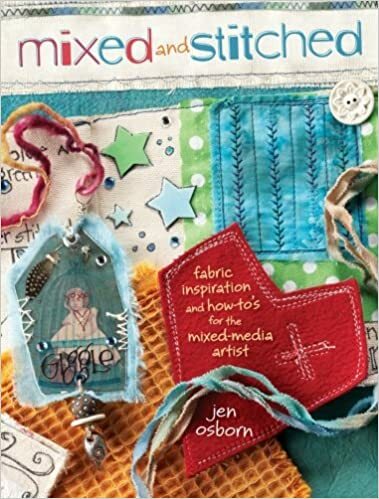 I was a little disappointed after reading this book; I expected more mixed-media projects but it's largely a sewing book with quirky projects. You should start right now! It instantly changes from something raw into something quilted, and almost orderly. Markings do not interfere with readability. The Out-and-About Purse is a stand-out with its stitched fabric leaf and vintage button embellishment. It's how I got started on this crazy art path, and it's still what makes my soul happy. To finish off the inside panel, all you have to do is sew the aqua solid strip along the bottom edge. 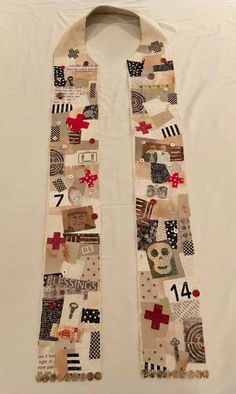 But there are some fun ideas and if you like to craft things in a somewhat shabby, messy style with lots of patchwork, appliques and raw edges, you may like the book. The apron gets dressed up with pretty patchwork, pockets and decorative stitching. Whether you're a mixed-media artist ora passionate sewer, discover innovativeways to combine fabrics, textures, foundobjects and more to create meaningfulpieces of fabric art. Take your yard of rik-rak, and straight sew it right down on top of your grey grossgrain ribbon. In addition to techniques, the book includes 16 projects to get your imagination flowing, including the Feather Your Nest Pillow, made with hand-dyed fabric and designer prints. The finishing touches are just as simple as everything else, but continue working their magic as you sew them on. Whether you're a mixed-media artist or a passionate sewer, discover innovative ways to combine fabrics, textures, found objects and more to create meaningful pieces of fabric art. The Art Apron is the stunner of the book, with the main panels salvaged from pants and skirts. Some fabric, buttons and decorative stitching finished off the cards! Original bonus embroidery designs to enhance the projects or spice up your own fabric creations. The personality of the author comes through in a show-it-to-you way, not a do-it-like-me way. May be without endpapers or title page. Step 1 I always like to do a dry run with my projects so I have a vague idea of what they will look like beforehand. Each project has step-by-step photos to show the tutorial, so the book reads very much like a sewing blog, which is a plus in my book. Building the inner panel is ridiculously easy. After you're set-up, your website can earn you money while you work, play or even sleep! A gallery of mixed-media and fabric art to help inspire your own works of imagination. Reading copies and binding copies fall into this category. The E-mail message field is required. Possible loose bindings, highlighting, cocked spine or torn dust jackets. To create the body of the apron, simply sew one of your 17 x 5 inch panels on either side of the inner panel you just created—just like in the previous two steps, but make sure your selvedges are facing outwards. My longtime friend, mentor, and constant source of inspiration, Jenny Doh, is doing something wonderful this year with the help of my new friend Cynthia Schaffer. Whether you're a mixed-media artist or a passionate sewer, discover innovative ways to combine fabrics, textures, found objects and more to create meaningful pieces of fabric art. The photography in this book is bright and crisp, and the projects have the appropriate air of whimsy for a mixed-media project book. Lay this over the top of your red pattern strip, and sew down the middle and both long edge with four straight rows. Once you have everything where you want it, you just have to start piecing everything together patchwork style Just like in my book. Paint and markers, fabric and thread. Other than the chapter on dyeing fabrics, I didn't learn much.